Senior eyes change and adapt with age. Of all our senses, according to most people,the eyes would be the most difficult to lose. Through the eye sensory and the brain we are able to detect the colors around us,the beauty in nature, behold the creations of life and the ebb and flow of our planet. We all should value and protect this precious gift; preserve it,and keep it in the best possible shape for as long as possible. According to National Geographic, this human organ contains about 70% of the body's sensory receptors; with its size being about one inch in diameter in adults. also, contain enzymes which neutralizes micro-organisms. Thus, blinking and tears provide lubrication; which keeps the organ protected and irrigated. Glasses vs contacts is an individual choice. Some say one or the other provides better vision, others feel more comfortable in one as opposed to the other and for some, it is a simple choice related to vanity. Whatever your situation, both require a responsibility in terms of maintenance and upkeep. Contacts possibly have more of a negative impact simply because bacteria that forms on the lens from lack of care can create or cause infection. Senior eyes become more dependent upon glasses or contacts to see more readily. Regardless of your choice just be sure to keep up with them and take care of them by keeping them clean. According to National Geographic, this human organ contains about 70% of the body's ​Aging, brings about changes in sight as it does with other body parts. Some of these conditions are related to the decrease in fluids, light, elasticity, flexibility and transparency. Somewhere around the age of forty adults will notice subtle changes such as; holding reading material far out to make out the words (the print appears to be too small), and lighting appears to be dimmer. Senior eyes can develop watery eyes also,but this can be checked with medication. With getting older be wise and: •Keep your eyes checked annually to offset any condition or disease. •Wear sunglasses on sunny days to protect them from the ultraviolet rays and glare. •Place extra lamps or higher wattage bulbs in areas where you perform close work, read,or have to distinguish details or color. •Don’t be afraid to ask for large print materials for reading if you need it. •Watch your diet because poor diets can cause health issues. •Hypertension, diabetes, glaucoma, cataracts, dry eye and macular deterioration are conditions and diseases that can affect your eyes,your overall health and well being. •Update your prescriptions for lens and medications. •Try the new discovery coming into the market, vitamins for the eyes; especially for those older and having certain eye conditions. The elderly face many adaptations and changes; however, to maintain that independence you so crave may require you to do the work necessary to give you that desired well-being. Aging does not necessarily mean you can’t do certain things, rather it just may require you to find a new or different way to do what you desire. Problems of sight: A common problem for seniors is visual acuity (low vision). It plays havoc with everyday activities. Reading activities for many become a chore: The print seems too small: how often are bills, instructions and labels dismissed; books left unread. Details and colors are hard to distinguish: medicines get mixed up and taken erroneously; matching clothing becomes an endless exercise. Decreased contrast sensitivity to boundaries: inability to distinguish change in surfaces (curves, edges, flat, signs, backgrounds, persons at a distance). Many of these can result in bad falls or accidents that result in injuries. Vision impairment affects one person in twenty,but as one ages, it increases; for those over age 65, one in nine persons experience serious vision loss.What is considered severe is when reading becomes difficult or impossible to accomplish without a strong visual aide. 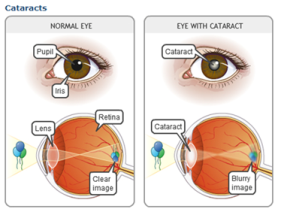 Visual loss may originate in the eye or may be caused by many different conditions that affect the whole body, and can vary from day to day. The visual system can hamper balance as well. Clarity of one's visual field, the size of it, poor depth perception,and tolerance of light/glare, all play an important part in the body's abilities to balance itself and remain upright. The signals which feed into the brain play a vital part in perception and movement in one's environment. Should either of these factors run awry,they can create visual problems. Transient ischemic attack- (temporary stroke-like symptoms that may be a warning sign of an oncoming stroke. In serious cases, such as of those mentioned above, the condition should be immediately evaluated by a physician, since they all can be life threatening. Severe loss of vision certainly means that you may have to reorganize your life and learn new ways of doing things. But, most people who have had visual problems for periods of time usually adjust using strategies they develop for themselves in their environment.